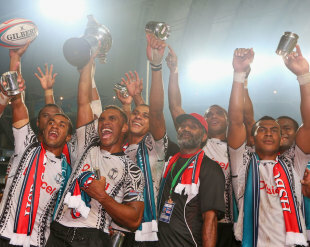 Fiji staged a sensational second-half comeback to clinch their second HSBC Sevens Series title of the season with a thrilling 26-19 victory over Wales in Hong Kong on Sunday. The Fijians came back from 19-0 at half-time thanks to a hat-trick from Osea Kolinisau to successfully defend the Hong Kong crown and deny a brave Wales side their first ever title in their first Cup final appearance. In the first-half Fiji were shell-shocked after Wales' Cory Allen scored two tries within the first five minutes. Things got worse for the Pacific Islanders after Ilai Tinai was sent to the sin bin for a dangerous tip tackle on Lee Williams that could have easily warranted a red card. Allen then went on to set up a third try for Wales as Alex Webber went over the whitewash to make it 19-0 at half-time. After a stern half-time team talk, Fiji bounced back straight away through Kolinisau, who soon followed up with another to make it 19-14. Samisoni Viriviri powered away to make it 19-19, which Kolinisau added to shortly after to put the score at 24-14. Emosi Mulevoro stepped up to put over the conversion with just 30 seconds remaining. Wales began their day with a 28-14 quarter final win over Canada, with Craig Price, Adam Thomas, Webber and Allen all scoring. In the semi-finals the Welsh produced one of their stand-out performances of the tournament with a 19-0 win over Kenya. Fiji beat Australia 29-5 in their quarter-final, scoring five tries in total, three of which came in the first-half. In the semi-final they faced reigning HSBC Sevens Series champions New Zealand. The New Zealanders started well, scoring two tries in the first-half but a second-half surge from the Fijians put the game out of question, with four tries being run in to make it 33-14 at the final whistle. Rocky Khan and Sherwin Stowers both scored two tries as New Zealand outclassed a tired Kenya outfit 36-5 in the third place playoff. In doing so, New Zealand gained 17 valuable Series points to remain well clear at the top of the standings on 113 points. Fiji are second, 25 points behind New Zealand, with Samoa, Plate winners in Hong Kong, a further four points back. England ended a disappointing campaign with a Bowl title by beating Hong Kong 42-7, the same score they beat France by earlier to book their place in the semis, where they defeated South Africa. Hong Kong delighted the home support and pulled off a shock 7-5 Bowl quarter final over Argentina before beating USA in the semis. In the Shield, Julien Candelon scored the winning try for France as they beat Argentina.